Just watching this movie makes you feel cold. There’s something to be said for the physical and emotional effect this film can produce just watching it. It's achingly beautiful, and achingly tough to get through, in part because of the difficulty of the struggle for revenge faced by the main character and in part because there is no respite from the difficulty of the elements. Yet that is undoubtedly quite purposeful. As open as the vistas may be, there's a claustrophobic feeling to the tale. By comparison to the tale of artists and actors in “Birdman” in which many characters have depth and backstory that Iñárritu carefully weaved together with a literal weaving of scenes by unbroken camera movements, “The Revenant” feels lacking in character. Many of its scenes mirror the long takes of unbroken camera moves, but this is not meant to be all one shot. It is nevertheless a breathtaking cinematic experience. However what little depth there is all but disappears after the initial call to action. The opening action sequence is as tense a sequence as was produced in 2015. It moves it's way slowly, carefully through the group of hunters while an invisible force of hostile Native Americans descend upon them. We are the helpless observer trying to keep up with the group as they flee this often unseen danger. As they make their escape they are ordered to return to their outpost to seek refuge from the elements and their violent pursuers. During this time we learn a bit about Glass and his half Native American son Hawk (Forrest Goodluck), and a great deal about the distrustful dissenter John Fitzgerald (Tom Hardy). As dislikable as he may come off, he isn't necessarily portrayed as a villain (at least initially). He is simply a scared man on the run for his life trying to make an unpopular decision in order to save himself and the majority of their party. This is humanity in its most miserable state. Frontier life was tough, and the people that lived during this time, even tougher. Hugh Glass was a legendary explorer and fur trader. In fact, it's the stories that turned the real Hugh Glass into a legend that “The Revenant” is based on, or perhaps aspires to. He’s played here by Leonardo DiCaprio in as strong a performance as I've seen him give. The story revolves around his quest for vengeance after being left for dead by the group of hunters he was leading. One morning, while off by himself, he was viciously mauled by a bear. This scene is one of the most visceral, harrowing scenes put on film in recent memory. It isn’t quite the disturbingly gory bear attack scene from “Backcountry” from earlier in the year, but we see more of the attack here, and the way it's shot and plays out is appropriately heart-racing. It’s a credit to his toughness that he put up enough of a fight to stay alive till his group could come finish off the bear before it killed him. Yet his condition made continued travel nearly impossible. The group, lead by Captain Andrew Henry (Domhnall Gleeson) decides to leave two men behind with him to see if he’ll survive the night while the rest of them move on to their outpost. The mistake is offering Fitzgerald more money to stay behind when we've already established that he doesn't care much for Glass and his son. Accept the offer he does though, but it’s clear he has no intention of sticking around to give the hostile, pursuing Arikara tribe a chance to catch up. Instead he tries to kill Glass, until his son shows up to stop him. Fitzgerald murders the boy in front of his debilitated father, then hastily tries to bury Glass while convincing his travelling partner, the young and easily influenced Bridger (Will Poulter), that the Arikara have caught up to them and they need to leave immediately. After he’s been left for dead, with anger and revenge left to fuel him, the film switches gears into survival mode. The real Hugh Glass was said to have crawled from where he was left to the safety of an outpost anywhere from 80 to 200 miles away. Iñárritu gives us that slow painful journey in slow carefully crafted detail. His punctured throat causes it to be impossible for him to swallow a small sip of water. So he cauterizes the wound with fire and a bit of gunpowder. The scene is done in one long take, and begs the question of how it was accomplished. It’s just one of many awe inspiring moments in the film. Along the way Glass avoids hostile killers, and finds refuge from the cold in a dead animal. Each moment is rendered in graphic, authentic detail. DiCaprio gives a natural performance. He is one of the best we have in American cinema. But his performance lies somewhere in between his dramatic capabilities and the very real pain of the hell it was to shoot this film. Iñárritu had the luxury of pointing his camera at him and capturing his natural response. I don't say that to downplay his performance as much to acknowledge what everyone on this shoot went through to get what appears on screen. And as simple in terms of depth the story may be, it becomes impossible to not root for this character. His pursuit of the man that killed his son and left him for dead is all Glass had to keep him going. It's long, perhaps too long for some, but it is a genuinely tense thrill ride bolstered by a strong cinematic vision and fantastic performances. Tom Hardy also gives a fantastic performance. He truly disappears in the role. In fact, he has enough facial hair and a thick enough accent that it's hard to pinpoint the person beneath the performance. 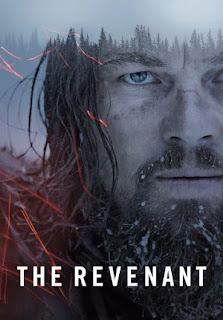 When it comes down to it "The Revenant" is an unremarkable tale of survival and revenge. Yet the way Iñárritu goes about shooting it is what makes it worth seeing. It is for cinephiles the type of film that makes us excited about the craft of filmmaking. And the experience of it is truly something to behold. It is like any survival story like "All is Lost," or even "The Martian," or "Gravity," of which this film shares more in common with the latter stylistically. They spend their time with a lonely survivor forcing themselves to escape one problem after another hoping to survive. "The Revenant" is told in beautiful expansive locales but shown in tight claustrophobic shots. The camera remains in near constant motion. There is stunning contrast in the way the camera slowly, smoothly, almost listlessly moves and pans capturing the fast paced, and brutal action all around it. It is an affecting film that succeeds in capturing what a tough, even painful, thing it was to survive the wild frontier. Seeing films like this, and knowing they're based on true stories often makes one thing clear to me: I'd die if I were put in this situation. And it probably wouldn't take that long.